Now here is an ambitious and creatively themed gambling slots online, as Pragmatic Play take on the Da Vinci code for a game with a real narrative. 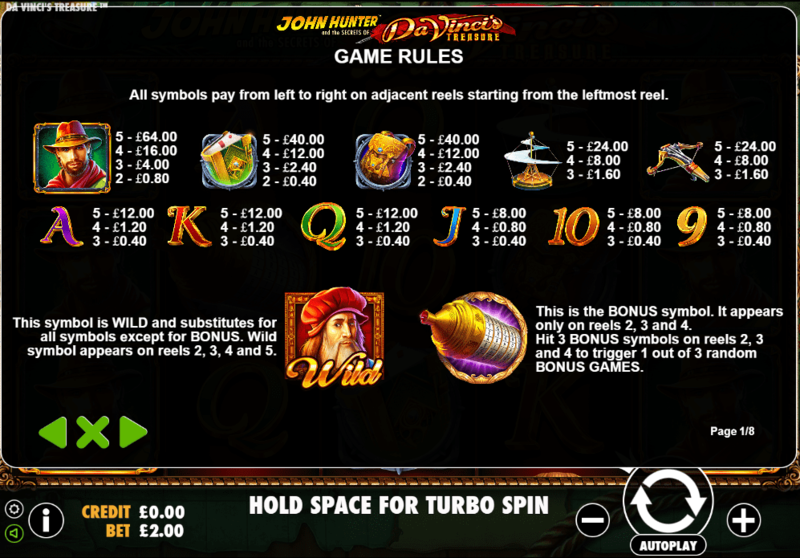 5 reels and 25 pay lines are what you have to work with on Da Vinci’s Treasure, with betting starting at 25p and going all the way up to £125 per spin, there is a lot of room to work with here and gamblers of little or plenty of experience stand a chance of getting Da Vinci’s jackpot, in coordination to the original bet of course. 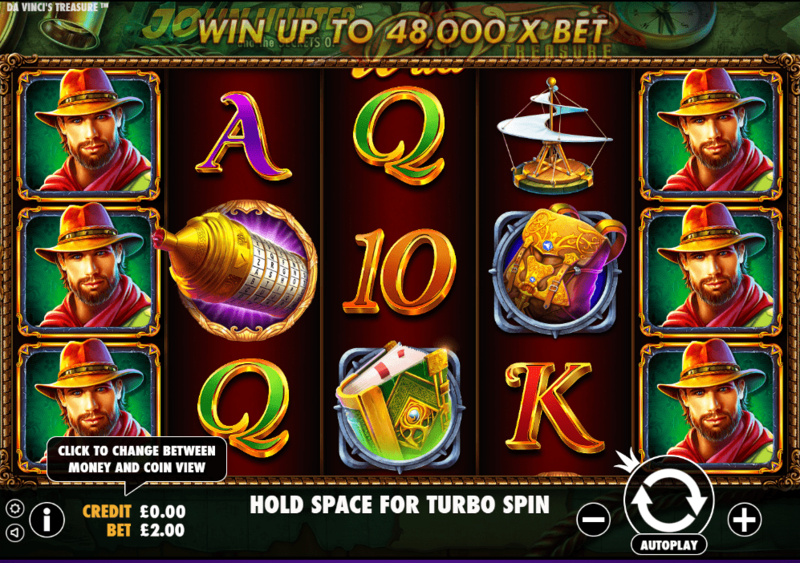 Made by Pragmatic Play, is this developer who we have to thank for taking on such an ambitious slot game. Tying in one of the most famous and notorious mysteries in the history of our earth, they translate the Da Vinci Code into a slot game really well here. Good graphics, smart features and a tastefully designed gameplay help them pull this feat off. Enjoy your experience when you find new slot games here from this well-known developer, Madame Destiny represents a similarly mysterious title that is well worth your time. Using one of the greatest artists in history to create the theme here, you would expect a work of art when it comes to the animations and graphics used. And, whilst the game isn’t exactly a Mona Lisa or even a Last Supper in terms of visuals, it is certainly a very well made and one of the well-designed best-rated slots to play! Animations are smooth and this goes a long way to assuring that the game has a very playable feel and one spin seems to lead to another seamlessly. A treasure map provides the backdrop to a slightly mysterious and mystic slot, and the attention to detail is clear in the graphics that make up this map. Mr Da Vinci himself acts as the wild in this game. As such, he is able to substitute himself in for any other symbol apart from the scatter to create a winning combination. Da Vinci will only appear on reels, 2, 3 and 4 and the scatter, represented by the code wheel, will only appear on these reels, too. Landing three of these at once is what triggers the attractive features on offer that include the Prize Picker and Free Spins. For taking on a creative theme, this game was always going to rank quite highly. However, the fact that Pragmatic Play have pulled it off so well only makes the game even stronger.